RANGOON – Representatives from the Myanmar National Human Rights Commission (MNHRC) have defended their response to what has become a high-profile case of abuse against two under-aged domestic workers in Rangoon. The girls, aged 16 and 17, described being beaten, cut, and forced to work for five years with little or no pay for the family who owns the Ava tailoring enterprise in Kyauktada Township. Once the girls were rescued, the MNHRC reportedly pressured the families of the victims to accept a cash settlement rather than push for legal action. During a meeting with members of the press on Wednesday, the MNHRC maintained that agreeing to monetary compensation—totalling US$4,000—was the most appropriate response in the case. The case of San Kay Khaing and Ma Tha Zin, from Rangoon’s Kawhmu Township, drew extensive media attention this week, with the human rights commission receiving harsh criticism for what was perceived as taking advantage of the victims’ and their families’ lack of legal knowledge and options. In the press conference, the MNHRC described their role as that of a mediator, engaging in five hours negotiations on Sept. 15 between the San Kay Khaing’s mother, Tha Zin’s aunt, and members of the family accused of the abuse. During this time, the MNHRC detailed previous “success stories” to the individuals of the commission’s past interventions. A protester writes a message outside of the MNHRC’s building on Wednesday afternoon, to express dissatisfaction with the commission’s handling of the case of child labor and abuse. 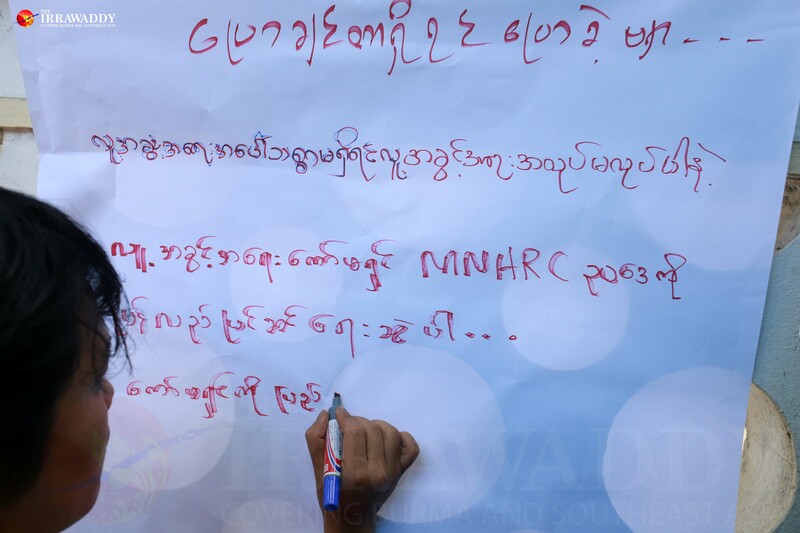 “We left them alone for 15 minutes to talk on their own and we respected their decisions, either to take compensation or to take legal action,” said Zaw Win of the MNHRC. Yet it has since been revealed that the MNHRC failed to speak directly to the victims, breaching Clause 22 of the commission law which states that they must investigate human rights complaints after they are received. Also on Wednesday afternoon, a group of rights activists protested against the MNHRC, in front of their building, for the commission’s inaction in the case. Following criticisms by media and on social media for what was widely deemed insufficient action taken against the perpetrators, Lt-Col Myo Thein, of the police force’s anti-human trafficking unit, filed a case accusing the tailoring family of torture. Rangoon police apprehended three members of the family on Wednesday afternoon: Daw Tin Thu Zar, aged 57, Ko Tin Min Latt, 37, and Ma Su Mon Latt, 27. Rangoon’s Western District Police are investigating the police from Kyauktada Township who initially looked into the case, to uncover whether law enforcement acted in accordance with police procedures. Police Major Khin Maung Htwe, who is heading the investigative committee, told The Irrawaddy that “action would be taken” if there is evidence that the police failed to perform their duties, but declined to comment further on the ongoing investigation.